Wondering what the tuition and fees mean on your bill? We break it down for you here. Please remember that payment of all charges is due in full by the due date specified on your bill. Students whose accounts have not been paid in full, or otherwise cleared through commitments by other sources will be subject to cancellation of class enrollment. Students will not be allowed to re-enroll without proper payment. The college fee is comprised of the General College Fee and the Laboratory, Equipment, and Materials Fee. The general college fee of $187.00 per credit is used to support instructional costs, student services, and maintaining the physical plant facilities. The Laboratory, Equipment, and Materials Fee (LEM) has been established to address the increasing costs of maintaining “state-of-the-art” technology equipment and supplies for specific courses. The LEM fee is $10.00 per credit for all technology and supply intensive courses. 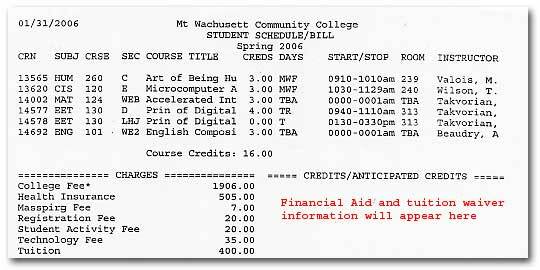 This mandatory fee of $50.00 is charged once each semester. This mandatory fee has been established to address a portion of the College’s cost associated with information technology. Specifically, this fee will, in part, offset some of the costs associated with expanded student services including Internet access, online registration, expanded email access, web based applications, multimedia and telecommunications improvements and expanded use of application software all of which are consistent with the College’s mission. The Information Technology Access Fee is $75.00 per semester for up to 8 credits and $100.00 per semester for 9 or more credits. This fee will be charged only to those students who are enrolled in nine or more credits and will be used to support student and community recreational, cultural, and social events and activities. It is a fee of $20.00 per semester. You may have an insurance charge on your bill. Health insurance is required by state law for all students registering for 9 or more credits in a degree program. If you have health insurance through another carrier, you may waive the charge. It is recommended the waiver be completed by the billing due date or your name will be submitted to the insurance company. Once submitted there will be no waiver or refund of the fee. Please note: free care does not constitute comparable coverage. Visit the Gallagher Koster website to complete your waiver. Tuition waivers are only applicable toward state tuition. The total value of this award will be adjusted to an amount that cannot exceed your state tuition charges. You cannot receive more than one tuition waiver (i.e. veteran waiver and financial aid waiver). Students with approved “grant(s)” have the value of the aid indicated on this bill in the “Credits” column with the total due adjusted accordingly. All financial aid awards that are not “authorized” for payment, but have been awarded, are indicated as “Memoed Financial Aid” as a total, in the “Anticipated Credits” column, with the total due adjusted accordingly. All student loans will be entered as memo items on the bill and will be “authorized” for payment when the loan funds are received from the lender. All MASSGrant and part-time grant awards will be entered as memo items on the bill and will be “authorized” for payment when final approval is received from the Massachusetts Office of Student Financial Assistance.